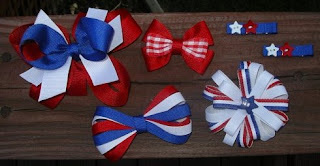 Bows by the Miles: Your Chance to Win FREE BOWS! I promised a chance to win free bows and HERE IT IS! Prize Package is worth $19.50! **You must leave me a comment on THIS POST. **You do not have to have a blog in order to enter, but you must leave me an e-mail address so that I can contact you WHEN you win! **Comments will be accepted until Sunday, May 18th at NOON! **Winner will be drawn at random. **Refer your friends. You get an extra entry in the contest for every friend who leaves a comment on THIS POST and mentions you as their referral! Because of shipping costs, this contest is only open to individuals with US or Canadian mailing addresses. So cute! Bee has super long hair, so we love hair bows and clippies. Count me in! Ok, what am I supposed to say? Tell me and I'll say it! : ) These are super cute! I make bows for Eloise and Lillian, but things have been so busy for me that I am way behind. Lillina has to wear bows or her hair falls in her face and then she gets syrup, oatmeal, and other food in it! You do a great job with your bows! We would love to win these bows. Jill and Daniel are going to be in the annual 4th of July Children's Parade this summer when we visit my parents in California. These bows would make beautiful accessories! Okay, so I have no children of my own, but I have several children that I am fond of...does that count enough for me to want to win free bows? And clippies - well, everyone can wear those! Sweet! I would love these for my little girl. These are gorgeous.